Earlier this week a group of volunteers gathered in Woburn, MA to chart the educational course of the AIIM New England Chapter. We’ve been working for several years to “put the program on rails” but we decided to derail a couple of old standards. One of those appears to be the notion that we should have one event every year dedicated to SharePoint. This used to be a slam-dunk event for the Chapter; in its heyday, tossing the word “SharePoint” after anything was an immediate win. We always tried to give our SharePoint events an AIIM-ish twist. We explored ‘Usability’ in SharePoint. We explored ‘Governance’ in SharePoint. We teamed up with the folks over at ARMA Boston to explore ‘Records Management’ in SharePoint and we tried to figure out what people are really doing with SharePoint. We had some success, but two things seem clear. OK, one thing seems clear and one seems a little fuzzy. Clearly, interest in SharePoint as a subject is waning among our members. Fuzzily, (oh my goodness, that is a word), the direction in which SharePoint is moving, or trying to move, is getting hard to predict. I’m not suggesting a doom and gloom scenario, but if we try to build an event around a product, we need to have a clear picture of the road ahead. So, rather that market a “message for SharePoint” that has benefit to the broader masses of Information Professionals, we are going to offer a series of messages for that broader group that we hope will attract people from the SharePoint community, too. Now that I’ve let AIIM NE’s agenda co-opt my blog space for a few hundred words, I think I’ll give you a break and bring this to a quick end. I would ask for a little help though. As many of you know, I am the Program Director for AIIM New England. We are trying to chart a different course this year, partly because, like many professional associations, we are struggling to find the right mix of topics that you (information professionals) will find interesting. If you have a few minutes, would you please fill out this survey? I promise you that it will only take a few minutes of your time and the results are very important to us. We, by the way, are a small group of like-minded information professionals (well, maybe not entirely like-minded) who volunteer our time to spread the word and provide meaningful educational events at a ridiculously low price to the broad community of (say it with me now) information professionals. Will You Be Able to Tell Your Stories? I want to make this a short post. It’s a holiday weekend here in the US and I’m trying very hard not to do anything that reminds me of work. No SharePoint, no ECM, no AIIM. No metadata, governance and no search. OK, there’s going to be a tiny little bit of AIIM, but just as background material. One of the friends of the AIIM New England Chapter is the National Archives and Record Center of Boston (NARA). We have had two recent events at their beautiful facility in Waltham, MA. Lately, they have been running a series commemorating the 100th anniversary of the Cape Cod Canal. NARA shares various interesting bits of their archive (our archives) fairly regularly on their Facebook page. They have a ton of content and they have proven to be very good storytellers. Along with the story of the US, they have also shared a little history of the National Archives. I’ve been fascinated by NARA’s presentation of US history but I’ve also been wondering if the future employees of our company will be able to tell our company’s story – our history. If your company is in and out of business in the span of 10 – 50 years, maybe nobody will ever care to hear your story. But, if you’ve been around a long time or if you’re planning to be around a while, someone will probably have to tell that story at some point. Do you know it? Will your successors know it? Will they be able to tell it accurately? Will they be able to make it interesting? You know what you need to tell that story? You need the facts. You need the images. You need the people’s names and the key events. You need the video, the audio, and the presentations. In other words, you need the information. For my readers in the US, I hope you’re enjoying a long weekend. Of course, the person requesting the slide was in a hurry. Someone is always in a hurry for things like this. So, I agreed to make the changes. I immediately regretted that decision. 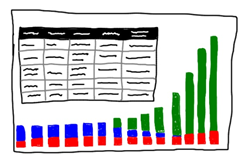 The “chart” wasn’t based on data – This happens a lot in business. Someone wants to illustrate a point, but the numbers don’t lend themselves to a nice chart because some are very small and some are very large. 100 million as part of 10 billion for example, is hard to see on a stacked bar chart. What lots of people do in that situation is make up numbers that illustrate the relative proportion but aren’t numerically accurate. I’m good with that – that’s fair and that works. However, it would be nice if you left behind the ratio that you used. Other than that, we were good. The table wasn’t a table – It was an image of a table. That’s OK. In fact, it was probably necessary since PowerPoint tries to not let you create a table inside a chart. Visually this was a nice idea, but whoever did it failed on execution. The table didn’t exist. Anywhere. No table to edit. I had to recreate the entire table, including the new row. In addition to the above issues, there were some things about this slide that were curious. The activity being illustrated wasn’t complete. The start and end data points were correct, but 3 data points along the way had been omitted. I know enough about our business to guess why the author chose to leave those three points out. They would clutter the chart and make the table too big and you could easily talk to those points, but I am guessing. It would be nice to know what the original purpose of this slide was. When I corrected the chart, I changed it in Excel so that if anyone ever has to edit this in the future, they can add a row, change a string or select a new color. I created the table on another (hidden) slide in the presentation. Now, if we need to edit the table, we are editing a table. Then we can do the whole copy and paste as an image thing. I also left a few breadcrumbs behind to explain things like the ratio that I used on the bars and the instructions for editing that table. If we want the information artifacts that we create to have value to people in the future, we have to help them. We have to allow for change. Simple things like the company logo can change. If you are illustrating company data over time, you should expect that people will want to continue the progression in the future. If you used a special technique to analyze or manipulate the data, you should describe that technique or at least include a link to a Wikipedia site, I mean how hard is that? Most important, a short summary of what your slide was used for, what you added by way of description and who your intended audience was would be helpful. You can easily add stuff like that to the speaker notes section. The happy ending to this story is that starting Monday, we are getting an intern. His primary task will be to help us move the contents of a public-facing SharePoint site into Citrix ShareFile. If he finishes that, or if he gets bored, he can set up a slide and presentation library for us in SharePoint. Hopefully, he can polish the diamonds in the rough like this, and organize those presentations I found a few weeks ago. That will soon be the title of this blog. I’ve registered the domain. I’ve mulled it around in my head and that’s the best I could come up with. Well, it’s not the best but technologyStories.com is a premium domain and GoDaddy wants $2,588.00 for it. Sorry. Not happening. Besides, it’s not about technology, it’s about information. Really, it’s about people, but this isn’t where I want to write about people. The fact of the matter is that it’s about inflection points. SharePoint is at an inflection point. It went from being a hot new product to a must have product to, or at least it’s approaching being a legacy product. I should have known better when I named this blog. I’ve been in this industry for my entire career and technology is ongoing, but no single technology really has the staying power worthy of a domain name. It’s OK, the name had a good ride and if I manage the transition well enough, I’ll keep a few of you as readers. After all, you didn’t come here for my SharePoint knowledge. My favorite comment ever on this blog is “I like that you explore the ‘why’ behind the solutions.” The ‘why’ by the way is people. I write about ECM and content a lot, but Content Management is at an inflection point. Some people say that it is past the inflection point. But, those are marketing types. Marketing types are always ahead of the curve with regard to change. Marketing types want to use terms at the moment of peak hype and then relegate them to the dustbin of ‘legacy’. Marketing types have had SharePoint and ECM in the rearview mirror for quite some time. I can tell ECM is in the mirror because ecmStories.com is available for 12 bucks. Operations Research, by the way, was all about process. I love process but the instructor was right, it really is about people. ProcessStories.com is available, but is has those 3 s’s in a row and it sounds dumb. And really, who wants to read about process. Process is boring and belongs behind the scenes where it can’t hurt anybody. So, Dan, why don’t you call it peopleStories.com? Well, there are two reasons: 1) peopleStories.com is not available. peopleStories.info is but, again, dumb. 2) I’m not qualified to write about people. 3) Wait, you said there were two reasons. I know, but 3) I write about people and my thoughts and ideas as they relate to people on No Facilities. See, I needed a third point to plug my other blog. I write from my experience. My most recent experience is being collected at ANI. ANI is at an inflection point. We are planning for the retirement of a bunch of senior folks who have information in their heads. We are simultaneously planning to support a bunch of younger folks who want to be able to find that information without having to live in it. But, I can’t really talk that much about ANI. Yes, information. Because that’s what people need most, and that’s what I do. That’s what I’ve always done. I have spent over 35 years finding ways to put data into context in order to create information and then to give people access to that information in a way that helps them to perform their business process. Technology will continue to morph itself from file shares to SharePoint to a different kind of file share (DropBox, Box, ShareFile, OneDrive, iCloud – I have one of each of these) and onto other things once people discover (again) that file shares don’t really work and that search (alone) doesn’t really work. Dropbox and all the Dropbox wanna-be’s of the world will add metadata to their product, and the marketing folks will give it a clever sounding name and some dumb kid will create a blog using that word. A few months later, the marketers will tag the word as passé and a few years later, the industry will be calling it legacy and the dumb kid will be searching GoDaddy. Thanks for reading this blog for over 5 years. I’ll be making the turn soon, and I hope to keep you on board. Two recent projects have caused me to realize that SharePoint has finally arrived in our small organization. I don’t mean that it’s here and in use, it’s been here since 2006. I don’t even think I’m talking about “adoption” the way that word is often used with respect to SharePoint. It’s arrived in that it’s now part of the permanent landscape and that’s a good thing. It’s good because people aren’t fighting the idea of SharePoint. On the other hand, SharePoint has only managed to shove itself into the mix. It isn’t the dominant player. It isn’t calling the shots. It’s on the team but it has to play by the same rules as everything else. One of the projects we are close to completing has SharePoint in the leading role. The application is a portion of our payables process and people are now creating payment requests in SharePoint. Other people are reviewing those requests, adding comments and still other people are approving those requests. If all of this lived in SharePoint, SharePoint would rule the day. However, the back-end of this process is a desktop application that takes those approved requests and prints checks. That application also creates ACH transactions and wire-transfers. Eventually SharePoint will be the starting point for all those transactions, but everything SharePoint does has to feed that system. Other processes are involved too. For example, we can’t present a payable for payment without making sure that the person / company we are trying to pay isn’t a terrorist. In that case, the back-end process is actually the starting point. We check vendors before we authorize them to be paid and we continue to check to make sure they don’t become terrorists. I suppose the back-end stuff could be done in SharePoint but it’s easier the way we’ve done it. Note: All of those processes involve data that is stored in SQL Server and my crew had to battle with every imaginable issue (all of them permissions) to get those connections working reliably. The second system we are working on is a storage system for some very important information. In order to make sure this stuff is available when we need it, it will exist in SharePoint on premises, some of it will be replicated in SharePoint Online and some will be replicated on a bunch of iPads. In this case, SharePoint is cast in the boring supporting actor role. Yes, SharePoint is holding all the stuff in house and holding all the stuff online, but the iPad app is the cool kid. Accordingly, SharePoint has to try to fit in. We decided that the way the content is organized in the iOS app will determine the way it is organized in SharePoint. In other words, the list and library structure in SharePoint will correspond to the structure of root categories and detail topics in the iPad app. The app design is intuitive, something that SharePoint struggles with out of the box. The design is simple enough that it won’t take much work to make SharePoint look and feel consistent with the iPad. Still, a few years ago, this wouldn’t have been a consideration. SharePoint and SQL Server was an arranged marriage and like many of those, it works, but it’s weak on love. We are making the connections work, the connections do work, but they all seemed to have taken more effort than should have been required. SharePoint and iPads? I’m pretty sure that was never part of anybody’s plan, but it has to work. We have to build a solution that spans those platforms and looks like it was meant to be. Welcome to the real world SharePoint. Realizing that the thing you need your coworkers to do in order for your SharePoint solution to work, is something they already like doing. Yeah, that was too long for a title, but that’s how I feel right now. It’s as if my doctor had told me that “in order to remain healthy, you need to eat more Heath Bar Klondikes.” In addition, my new found happiness reveals one of SharePoint’s often overlooked strengths. Yes, if you want to, go get a Klondike before reading; it’s ok. The project that I’ll be working on while my coworker and friends are in Vegas is one where we hope to link several aspects of our engineering process. To do this, we needed to refine an identifying number that has been in use forever. To really achieve that value we are looking for, we need a way to make it seem like this new way is the way we’ve always done things. The really cool thing is that SharePoint can make this all possible. I’ve talked about bits and pieces of the neighborhood in which I’m working before, loss control inspection reports, recommendations and composite views of data. We have a solution that lets us track and support the development of a loss control inspection report. Ultimately, that process ends with the final report being stored as a PDF, in a records library – locked away forever. However, the process leaves the Word document that created the PDF, behind for review. Keep that in mind. How are they being addressed? Where are they in that life-cycle? We built a series of custom lists to aid in this process. We also built a couple of composite pages, aided by some data view web parts to assist in that review. Still, something is missing. What’s missing is the link between the reports in which the recs originated and the recs and the rec-review process. My job is to establish those links. This is where ECM projects often run into trouble. We have hundreds of reports. We have hundreds of recommendations. Most of the recommendations are ‘closed’ but they still have value. A lot of information is coded into those custom lists, but the real value, the mother-load of information, is in the original reports. The trouble is that this isn’t a one-and-done process. The recs can appear in many reports over time and any single report can refer to multiple recommendations. It takes time to review, reread, search and add metadata to those reports in order to link them to the lists…or does it? Well, it seems that it will take some time, but not much. It also appears that going forward we can keep the reports and the recs in sync, with little or no effort at all. The key to my happy day lies in the fact that SharePoint, with the aid of some workflow add-on products, can read those reports. Further, it turns out that the way our engineers like to write those reports, their “style,” the style they’ve been using forever, lends itself to being picked apart by Regular Expressions. The reports already have metadata that tell us what policy they refer to. The recommendations have an ID number that tell us what facility they refer to. Today, I built another SharePoint custom list that links those facility ID numbers and our policy numbers. Now it looks like I’ll be able to have a workflow read the reports, pick out the recommendations and automatically maintain the activity in the recommendation lists. If this is successful, once an engineer finalizes a report, a SharePoint workflow will create a stub new recommendation or a stub recommendation update item, and then create a “please complete this item” task. I’m talking in the future because I’ve only completed the proof-of-concept steps. I can read the reports. I can find the recommendations. I can build a new composite identifier and I can stick it in every custom list where it’s required. I usually wait until I have a solution to write about it, but this was so much fun, I needed to share it. When I finish this project, I’ll let you know how it works, in this blog and at AIIM14. If I fail or partially fail, I’ll write about that, too. Other Subjects – You may not have noticed, but at some point in 2013, I changed the tag line to include Information Management. I did that because I really do believe that it’s more important to understand why we do things than it is to know how to do them, and why we do things doesn’t always have anything to do with SharePoint. I had the privilege of working with several people during 2013 who reminded me that SharePoint is a technology with which we can improve business processes, but that the nature of those improvements often has nothing to do with technology in general, let alone this specific technology. Other People – One of my major objectives at work is to prepare a new generation of employees to run my portion of this railroad after I retire. My retirement isn’t imminent, but our business is rather unique and learning about all the moving parts takes a long time. I’m not a minor player in our SharePoint cast yet, but I am becoming more of an end-user of SharePoint than I was in years past. So, in the future, when I say that “we” did something, keep in mind that I probably should have said “they” did something instead. Becoming a user of SharePoint might give me a different perspective from which to write about User Experience – that might be fun. Unfortunately, I’m not nearly as comfortable writing about the mistakes others make as I am writing about my own mistakes, so, “they” might have to continue to suffer my development efforts. Other Software – One of the first posts of 2014 will be about a content management solution that doesn’t involve SharePoint. We remain a SharePoint shop and a Microsoft-centric shop, but it’s no longer an exclusive relationship – we’ve decided to see other people. It’s OK, I told SharePoint “it’s not you; it’s me.” In a sense, this is really just a small extension of a previous theme. I’ve written numerous articles about software that we have bolted onto SharePoint, integrated inside SharePoint or used in order to affect SharePoint. I’ve also written about the stuff that we have written or paid someone else to write that runs within SharePoint but didn’t come in Microsoft’s, or anybody else’s box. I will continue to write about those things, too. In fact, I look forward to writing about a project management solution we recently purchased that runs inside SharePoint. Other Blog – This last bit is nothing more than a shameless plug. I chose the meme for this blog because I enjoy telling stories. If you enjoy the storytelling nature of this blog, you might like my other ongoing attempt at writing – No Facilities. That blog is rarely technical and almost never about SharePoint. The tag line over there is “Random thoughts, life lessons, hopes and dreams” and it grew in popularity quite nicely in 2013. Thanks so much for visiting this blog. Have a happy and prosperous New Year! I have spent most of a 35+ year career working with structured data in the orderly realm of systems development and database management. Unstructured data – that was just a polite way to refer to the pile of paper on my desk. I am Vice President, Information Services for American Nuclear Insurers and I am part of a team at ANI that is addressing Information Management. What you read here is me, my opinions, not ANI’s. As Information Management expanded beyond SQL, I turned to AIIM for education and guidance, so you will see AIIM mentioned in many posts. With a nod to transparency, I am currently on the Board of Directors of AIIM International. My experience is drawn from work, past and present, and the human and digital contact with people doing similar jobs I have been exposed to through AIIM, other associations and social media. My experience is drawn from work, past and present, and the human and digital contact with people doing similar jobs I have been exposed to through AIIM, other associations and social media.